Looks like a decent price for a clever idea. Great idea! But MUST SAVE MONEY! Or fix it by the door. "We usually ride the camel to go to a brothel." Great for exposing when pervs are hiding in your wardrobe. So when you open your wardrobe the light comes on? Yes, that sounds like the smart way to use the motion sensor. Didn't realise it sounded sarcastic. Sorry. The way I read it, I thought he was confirming (as a good idea) your notion that the actual opening of the door would indeed trigger the sensor if it was placed beside the door. 8cm range! That is crap. Also goes off after 30 seconds, my misses takes 30 minutes to decide what to wear. Yes, but its only 8cm range, so you'll always be waving at it. Might aswell buy a switched light. 8cm range! That is crap. Also goes off after 30 seconds, my misses takes … 8cm range! That is crap. Also goes off after 30 seconds, my misses takes 30 minutes to decide what to wear. Like earlier comments, you can fix it by the door. As you open it it triggers the motion sensor to switch on the LEDs. After closing the doors, with no further motion detected, it is switched off after 30 secs. That's my guess of likely scenario. No sarcasm intended - it is my guess as I have not used it yet. The way I read it, I thought he was confirming (as a good idea) your … The way I read it, I thought he was confirming (as a good idea) your notion that the actual opening of the door would indeed trigger the sensor if it was placed beside the door. Thanks, just what I was after for a cubby hole and has added bonus of motion sensor. Voted cold, last one I had lasted a week. Did Lidl exchange it OK? LEDs don't give off a very natural light. This could potential lead to a fashion disaster, if say you confuse your cerulean blue with your cerulean frost sweater. I wonder if the range is a misprint. 80cms would be fairly useful, but 8cm is just useless for general use. As sprite127594 said, you'd be waving at it every thirty seconds. Just seen the comment from MrsSmith2012. Looks like it must be a misprint on the range. I might get one for the bathroom. There was something similar (in use) at Poundland. Don't think it was LED lights but basically you place it on the inside of the wardrobe next to the edge of the door. There must be a pressure switch with it that triggers the light so I think time delay won't be a problem. There was something similar (in use) at Poundland. Don't think it was LED … There was something similar (in use) at Poundland. 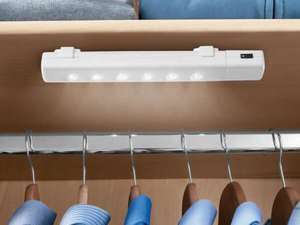 Don't think it was LED lights but basically you place it on the inside of the wardrobe next to the edge of the door. There must be a pressure switch with it that triggers the light so I think time delay won't be a problem. So apart from not being LED, and not having a motion sensor, it was very similar? There are many of these available - search Amazon for "LED motion sensor" to see a few. In my opinion, the "Mr Beams" ones are the best, but they're more expensive then this (and perhaps not shaped as well for a wardrobe). You can get a pack of 3 for £24.50, which isn't much more. LEDs don't give off a very natural light.This could potential lead to a … LEDs don't give off a very natural light.This could potential lead to a fashion disaster, if say you confuse your cerulean blue with your cerulean frost sweater. Ironically that's not actually the case, the 'cold white' light produced by the lower end LEDs is actually very close to natural daylight, filament bulbs are a lot warmer than natural light. It's just most people have become accustomed to the warm filament lamp colour. In reality it's now possible to get LEDs in pretty much any colour temp, though cheap ones and the brightest ones are always likely to trend towards the cool white 5500+ K colour. Yes, but its only 8cm range, so you'll always be waving at it. Might … Yes, but its only 8cm range, so you'll always be waving at it. Might aswell buy a switched light. Yes and if you wave at it,you may encourage anyone actually hiding in the wardrobe? Might get one for ds loo as I always forget to turn the light off. Does anyone know what batteries it takes and how many, thanks? Wow! I consider myself well and truly schooled! Nah, one assistant, one till open, queue backed up to the middle of the shop so I binned it instead. Won't be going back. You are supposed to fix it by the door as in the picture. As the door is opened it will trigger the motion detector and switch on the LEDs and stay on as long as there is movement for 30 secs. Good for the car, if you don't have a boot light!